Stacey Earle, a native of San Antonio, Texas, came to Nashville in 1990. 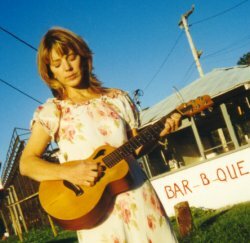 She was asked by brother Steve Earle to sing backup on "Promise You Anything," a song on his fourth studio album, The Hard Way. She was "thrown in the fire" only two weeks later when Steve asked her to sing backup and play guitar on his upcoming arena tour. The tour encompassed most of the major cities in the US and then took her around the world to Australia, New Zealand, the UK, Ireland and Canada. This tour gave Stacey a taste of the professional music world and she loved it. She started writing her own songs and zealously started searching out writer's night showcases for her music. She started hosting her own writer's nights at Jack's Guitar Bar. She was good for Jack's and in turn, Jack's was good for her. It was here that she met Ashland City native Mark Stuart, a fellow songwriter and musician whom she married in 1994. Stuart plays lead guitar and does vocal backups for Stacey's band, The Jewels, which is named for Stacey's 93-year old grandmother, Jewel Earle, who is her and Steve's best fan. Stacey is a prolific writer and obtained several cuts through her affiliation with Ten Ten Music Group, Inc. including "For Years" by Sammy Kershaw which is on his Politics, Religion and Her album. She has acquired a local following at her live performances in Nashville and several other cities in Kentucky, North Carolina, Georgia and east Tennessee. Stacey has maintained a fierce independence in making her own way and has produced her debut album Simple Gearle which has been released on her own label, Gearle Records.